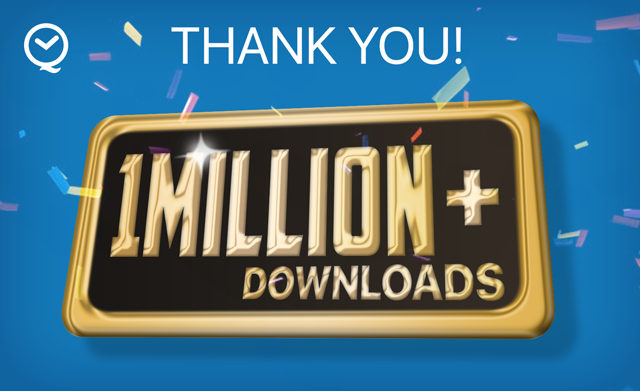 We are extremely excited to announce that Quality time has reached a new milestone, with more than 1,000,000 users like you downloading our app. We would like to thank each and every one of you for your support. This would not have been possible without your valuable feedback on how we can continuously improve the app and the new features that should be introduced. Our team are thrilled to see how people worldwide are becoming mindful of how they spend their time on their mobile devices, and moreover, some are in fact taking actions to digitally unplug themselves using our app to focus on the task at hand. The United States tops the QualityTime download list with 14.4% of app downloads. This is followed by Germany with 9.3% of the app downloads; India with 8%, and Brazil with 4.6%. Netherlands is right behind with 4.5% downloads and last but not the least is the Spain with 4.1% app downloads. Completing the pie chart are other countries such as Saudi Arabia, United Kingdom, France and Taiwan with a total of 59% downloads. It’s incredible that QualityTime has reached such a global audience and that people around the world are enjoying more quality time. Rated 4.2 on Android Play Store, we are always working towards how we can allow you to manage your digital diet better. Currently, we are working on this exciting feature which will enable you to download all the past mobile usages to analyze your usage pattern to do all sorts of fun analysis. So stay tuned. It always warms our heart to hear your stories about how the app has helped you to make time for things you love doing, and manage your schedule away from technology in a way that works best for you. Do share your stories at support@zerodesktop.com. We would love to hear from you.